Virtual reality headsets are becoming more common and affordable. This device generates realistic images, sounds and other sensations that mimic really life environments. “Learning by doing” is a model that has been practiced in schools for many years now. Virtual reality (VR) is becoming more popular in education because it allows the user to interact with the space and objects depicted in the space. However, due to this technology being new, there is a lack of research to predict the long term effects. Children’s brains are very “plastic” and prolonged exposure to these devices could potentially create damage. Children also lack the ability to voice how the device makes them feel both physically on their head but also internally such as a strain on their eyes. Virtual reality is not much different than a child watching TV for long periods of times. For many years now parents have been against their children watching TV for too long or likewise, playing video games for an extended amount of time. 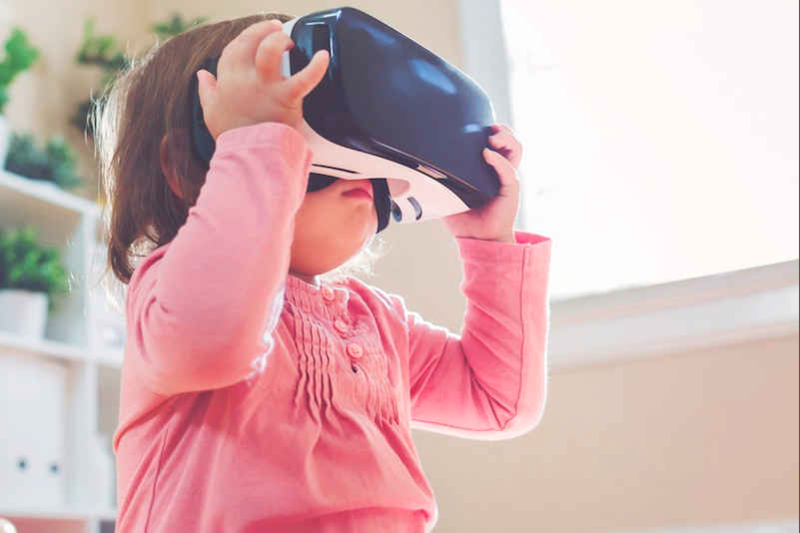 With no research to defend why these devices are safe or unsafe for children to use, many researchers are hesitant to promote VR to children and VR to be used in elementary education. This entry was posted in Uncategorized by Katherine Hannah Shea. Bookmark the permalink. Virtual Reality is a very hot topic in today’s society. You cant turn on the news or look at the internet without seeing something about virtual reality. While is big and very interesting, there are still some very big concerns. Since they are so new there just isn’t enough testing to prove they have no effect on the brain. Kids brains are like sponges, and even the tiniest interference can be seen later down the line in their development. I could see some type of motor issues developing in children that spend long amounts of time using virtual reality especially for extended periods of time. I dont think the virtual reality kits are going to be that big of an issue at the end of the day. If we see that they do affect children in a negative light than we can implement heavy regulations to make sure they never use them. I agree on what you said. The virtual reality is the most popular innovation in these days. Also, it is popularly used in the education, too. The students can interact with other people in virtual reality, and can do many things in limited space. However, there is a problem. Is virtual reality headset safe for the kids? The first problem is related to the brain. The kids’ brains are growing. If the kids use the virtual reality headsets the neurons will shut down and it is unsafe. Because, it could stop the development of the brain. Thus, the researchers say that the kids should stop using it. There is one more problem on VR headsets, which you didn’t mention. The kids’ eyes are still growing and the VR could give bad impact on their eyes. When people are using the VR headsets, the headset is in front of eyes. The researchers said, “Modern VR headsets achieve the illusion of depth by presenting each eye with a slightly different image on a flat screen.” It means that the eyes will not focus and just remain focused on the flat surface. The kids’ eyes are still growing so it could give permanent damage to the eyes. Also, the VR headsets are released a short time ago, and it is not researched enough. Thus, people don’t know the long term effect when they use it. Therefore, the kids should stop using it, and wait until the VR headsets are researched fully. There are several dangers involved in using Virtual Reality headsets and other devices. Some of which are minuet and shouldn’t be too difficult to solve; such as motion sickness or tripping over wires. A more important issue with HMD (Head Mounting Devices) VR is the constant pixel display. Cheaper HDM VR headsets contain the same size pixels across the entire screen, this close up, one-dimensional view can case serious strain on the eyes. In the natural world, we view things with constantly changing distances and perspectives which is nothing like cheap HDM VR headsets. Similarly to cellular phones and countless other devices, HDM VR headsets give off radiation. Children are much more susceptible to retinal radiation due to their undeveloped eyes. Also, young children are a big target demographic for markets and VR industries. The majority of VR headset manufacturers are setting age limits. The Oculus Rift and Samsung’s Gear VR headset have a 13+ age rating. Sony’s PlayStation VR is not to be used by children under the age of 12. And though HTC doesn’t specify an age limit, it does warn against allowing young children to use the Vive. I would say VR has a lot of benefits for kids, Virtual reality opens the way to genuine idealism with a radical new level of immersive experience for children. VR headsets are essentially mimicking the way our eyes already work by showing each eye a slightly different image, which enables us to perceive depth. VR devices can mimic the equipment used to treat Orthoptic problems, such as lazy eyes. So, there is the possibility that virtual reality headsets could help diagnose eye problems, and even treat them, rather than cause them.“Manufacturers could build in vision tests and allow people to see that they might have a problem and should consult an eye specialist,” suggests Prof. Banks. I could also envision Virtual Reality having some negative effects on children. I have seen videos online of grown adults mistaking objects in the virtual reality for real life items (i.e. a man had to pick up a key from the ground in a game and tried to lean on a coffee table within the virtual reality mistaking it for a real life table and fell over). This could be a problem for children who use virtual reality, especially if they use it as much as growing children using iPads. Extensive use of a device like this may fool a developing brain into thinking a virtual reality state as the norm and lead to long term effects for developing children. Not to forget the danger of children running into real life objects while in virtual reality and harming themselves. I don’t necessarily think it will bad for children to experience virtual reality, but it is interesting to consider what the effects could possibly be if the situation was right. However, I believe virtual reality could be better than worse for children in certain situations (learning disabilities).